Today is the feast day of my Community -- the feast of St. John, Apostle and Evangelist. St. John is also my patron saint and the saint I try most to emulate in my daily life. 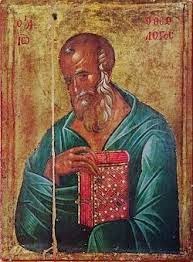 St. John, a fisherman, the son of Zebedee, and the brother of St. James the Great, was called to be an Apostle by our Lord in the first year of His public ministry, and he travelled everywhere with Him. St. John is known as the Beloved Disciple, the Apostle of Love. Why was he identified in this way? John loved Jesus greatly, and he demonstrated a meek, mild, tender, humble, and peaceable disposition that made him very much like Our Lord himself. Also, his singular privilege of chastity, his virginal purity rendered him worthy of this more particular love. As St. Augustine explains, "He was chosen by our Lord, a virgin, and he always remained such. Christ was pleased to choose a virgin for his mother, a virgin for his precursor, and a virgin for his favorite disciple. His church suffers only those who live perfectly chaste to serve Him in His priesthood, where they daily touch and offer His virginal flesh upon the altar." At the Last Supper, Jesus allowed John to rest upon His breast. John is the one apostle who never abandoned Jesus, but stayed by Him to the very end. John was the only Apostle present at the Crucifixion and stood at the foot of His cross. It is there that Jesus entrusted His mother to the care of His friend. Consequently, John took Mary into his home, loved her, and cared for her as if she were his own mother. Upon hearing of the Resurrection, he was the first to reach the tomb; when he met the risen Lord at the lake of Tiberias, he was the first to recognize Him. St. John spent his later life in Jerusalem and at Ephesus. He founded many churches in Asia Minor. He is credited with writing the fourth Gospel, and three Epistles, and the Book of Revelation. Brought to Rome, tradition relates that he was by order of Emperor Dometian cast into a cauldron of boiling oil but came forth unhurt and was banished to the island of Pathmos for a year. He lived to an extreme old age, surviving all his fellow apostles, and died at Ephesus about the year 100.